Last summer, I was asked if I would meet Mike Henbrey, Collector of Books, Ephemera & Tools, to create a portrait of him in the last few weeks of his life. In the event, we struck up a brief friendship in which I visited Mike over successive Saturdays for more than a month and he survived until November. Now, as the year draws to a close, I remember Mike and his beloved collections. 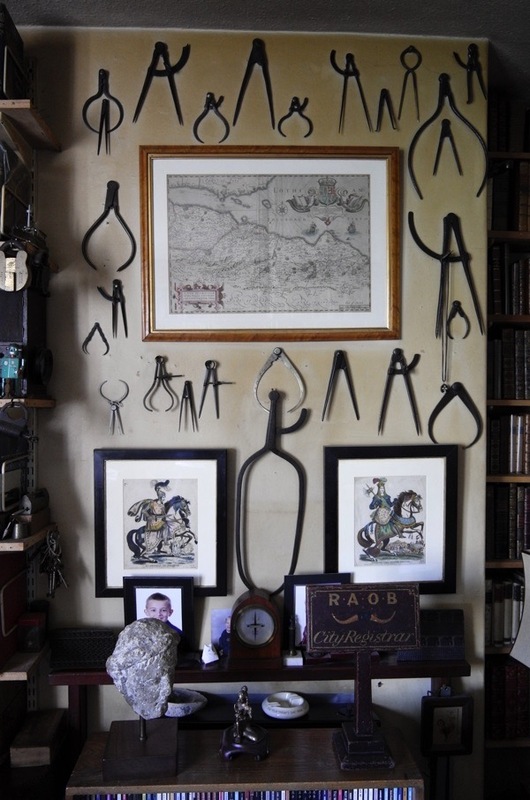 On the outside, Mike Henbrey’s council flat looked like any other – but once you stepped inside and glimpsed the shelves of fine eighteenth century leather bindings, you realised you were in the home of an extraordinarily knowledgeable collector. High up in the building, Mike sat peacefully in his nest of books, brooding and gazing out at the surrounding tree tops through his large round steel glasses and looking for all the world like a wise old owl. 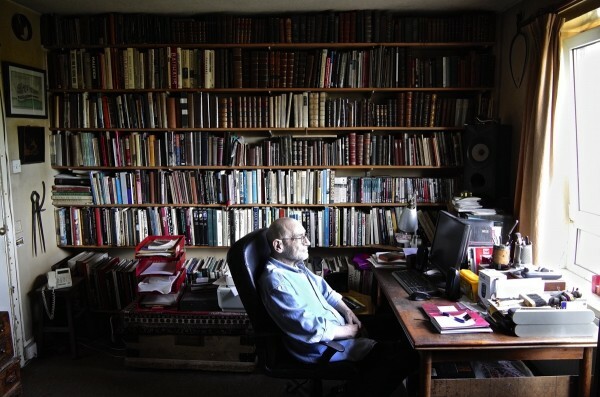 Walls lined with diverse pairs of steel dividers and shelves of fat albums testified to his collections of tools and ephemera. It was all the outcome of a trained eye and a lifetime of curiosity, seeking out wonders in the barrows, markets and salerooms of London, enabling Mike to amass a collection far greater than his means through persistence and knowledge. 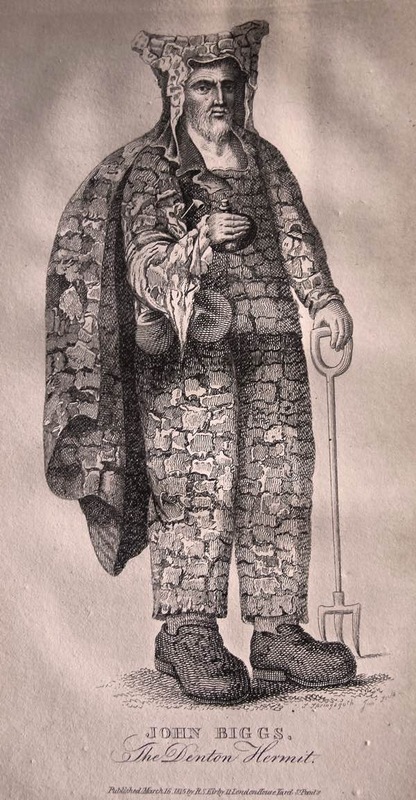 “Of all my collections, the Vinegar Valentines are the one that gives me the most pleasure,” he assured me with characteristic singularity, despite his obviously kind nature. 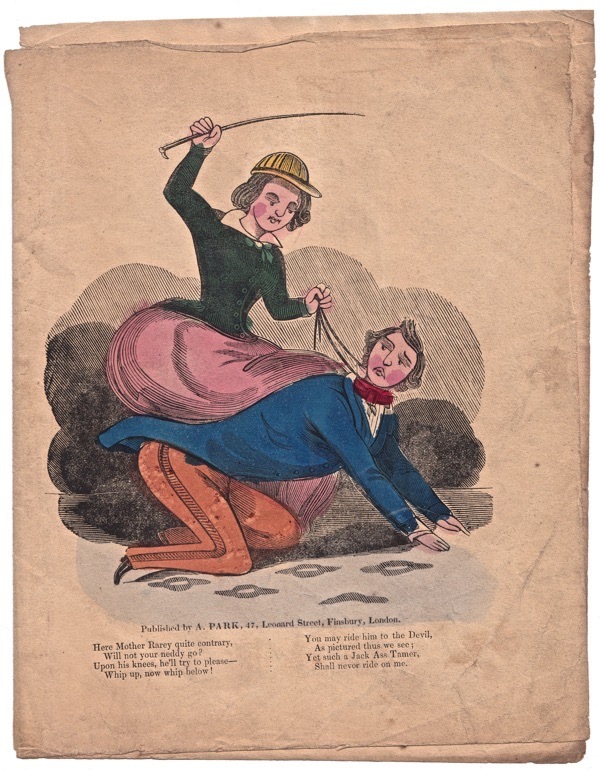 ‘Vinegar Valentines’ were grotesque insults couched in humorous style, sent to enemies and unwanted suitors, and to bad tradesmen by workmates and dissatisfied customers. Unsurprisingly, very few have survived which makes them incredibly rare and renders Mike’s collection all the more astonishing. Immensely knowledgeable yet almost entirely self-educated, Mike was drawn to neglected things that no-one else cared for and this was the genius of his collecting instinct. Of course, I wanted to pore through all of Mike’s books and albums, but I had to resist this impulse in order to discover his own story and learn how it was that he came to gather his wonderful collection. “I was born in Chingford in 1943 but, unfortunately, we moved to Norfolk when I was eight. I never liked it there, it was a lonely, cold and draughty place. My father James was a furrier and his father – who was also James – had been a furrier before him in the East End, but they moved out. My mother, Laura Lewis, was a machinist who worked for my father and I think she came from the East End too. I grew up playing in the furriers because my father had his factory in the back garden and the machinists gave me sweets. I think that’s where I got my love of tools. There was quite a lot of bombing in Chingford during the war and the house next to us got a direct hit which left a great big crack in our wall. I played on bomb sites even though I was told not to, and somehow my mother always seemed to know. I think it must have been the mixture of brick dust and soot on my clothes. It was a filthy dirty job, being a furrier, and, although my father was a good furrier, he wasn’t a good businessman and he ended up in bankruptcy when I was eight. So that’s how we ended up in Mundesley by the sea in North Norfolk in the early fifties. As soon as I left school at sixteen, I headed back to London. Ostensibly, it was to complete my training in the catering trade but I hated it, I had already done a year at catering college in Norwich. In reality, I was taking lots of drugs – dope and speed mostly – and working at a night club. I got a job on the door of club called The Bedsitter in Holland Park Avenue. I actually had a bedsitter off Holland Park itself for five pounds a week with a gas ring in the corner. That was a good time. I worked at a hotel in Park Lane for a few months. The chef used to throw things at me. They fired me in the end for turning up late. I drifted through life by signing on and working on the side, and the club gave me a good social life. I’m a vicarious hedonist. I’ve always read a lot, I taught myself to read by reading my brother’s copies of Dandy and Beano. He was ten years older than me and he died in his early thirties. A hippy friend of mine was a packer at a West End bookshop in Grafton St and he got me a job there. I worked for Mr Sawyer, he was a nice man. He employed hippies because they didn’t mind his cigar smoke and he never noticed the smell of pot in the packing room. He employed me as a porter but he told me to buy a suit and I got a job in the bookshop itself. I learnt such a lot while I was there. It was nice to be around books, so much better than working for a living. Mr Gibbs was the shop manager, he taught me how to catalogue. He couldn’t understand why he kept finding more money in his pay packet. It was because we youngsters kept asking for a pay rise and Mr Sawyer couldn’t give it to us without giving it to Mr Gibbs too. Mr Gibbs taught me not to speak to Mr Sawyer until he’d been around to Brown’s Hotel for his ‘breakfast’ and I presume this was because ‘breakfast’ consisted of at least three gin and tonics. He was a kind employer, he didn’t pay much but you learnt a lot. 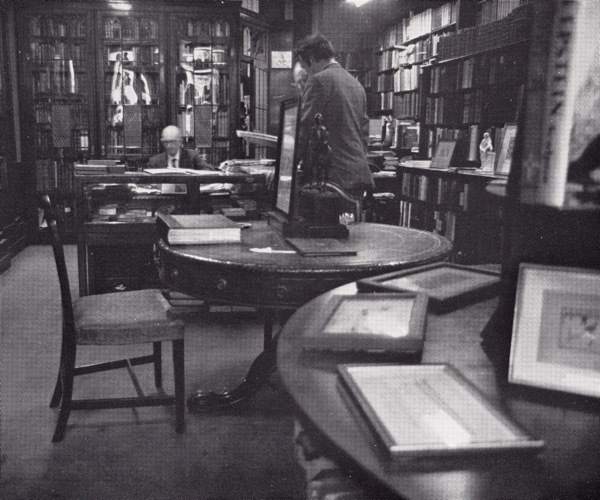 He had a tiny desk hidden behind a bookcase with two old spindly chairs that were permanently on the brink of collapse. The place was a university of sorts. I learnt so much so quickly. You can’t always recognise good stuff until you’ve had it pass through your hands. 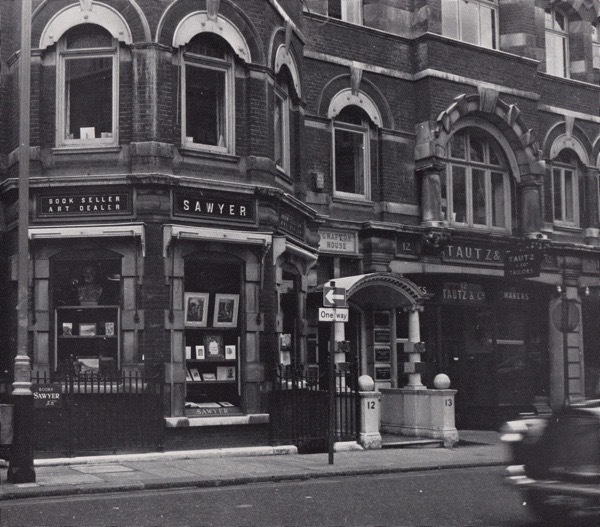 Mr Sawyer would go through the auction catalogue of books and mark how much you were to bid and send you off to Sotheby’s. You had to stay on the ball, because sometimes he’d make an agreement with other booksellers not to let him get a lot below a certain price, because he’d be bidding for a customer and he’d be on commission. 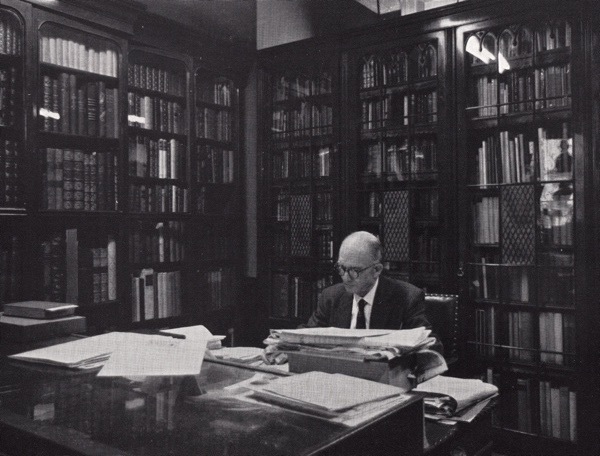 In those days, it was possible to make living by frequenting Sotheby’s and buying books. You learn a lot about the peculiarities of the bookselling trade. I think I was earning fourteen pounds a week. It was positively Dickensian. By then I had met my wife Jeanna. We got married in 1965 and moved around between lots of flats we couldn’t afford. Jeanna & I started a book stall in Camden Passage called Icarus. I love the street markets like Portobello and Brick Lane. We made a lot of sales and I bought some wonderful stuff in street markets when you could discover things, and I’ve still got some of it. We had two daughters, Samantha & Natasha, but Jeanna died young. We were living in Islington in Highbury Fields and I was left on my own to bring up the kids, who were eight and three years old at the time. That’s when I got this council flat, on account of being a single parent, and I’ve been here thirty-eight years. I lived on benefits with bookselling on the side to bring in some extra money and brought up my kids with the help of girlfriends. A friend of mine had a secondhand tool shop and I worked there for a while. You could buy old tools from the sixteenth and seventeenth century for not very much money then, and we had some that no-one ever wanted to buy, so I brought them home. 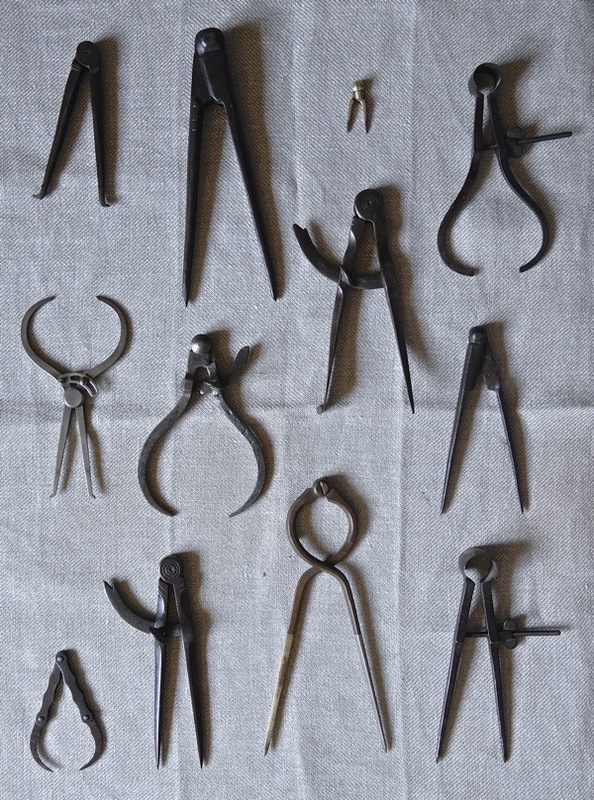 I am fascinated by tools for specialist professions, each one opens a door to a particular world. I still have my father’s furriers’ tools and they pack into such a small box. From then on I’ve been a book dealer. Once you fall out of having a regular job, it’s difficult to go back. I think my kids regard me with mixture of mild disappointment and tolerance. On occasion, they have generously put up with me spending money on books instead of dinner. 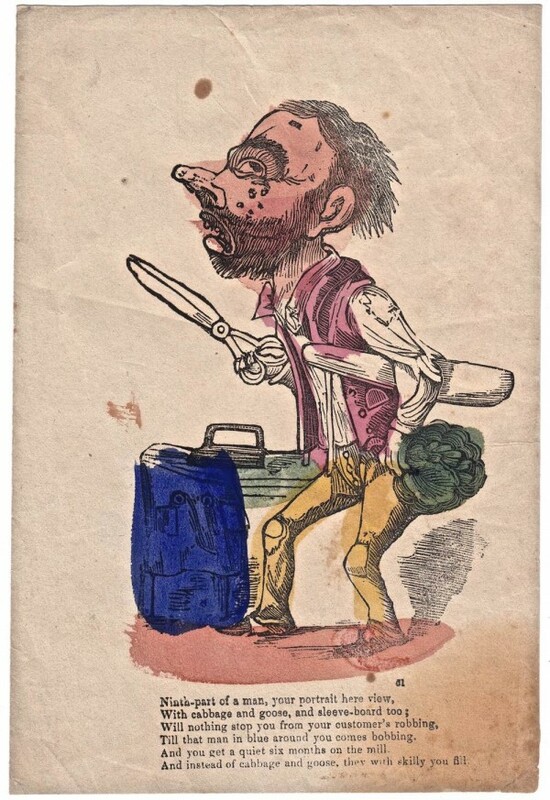 NOTE – Lumskull is not in my Green’s Dictionary of Slang nor indeed the OED where one might have expected it as an alternative spelling of num(b)scull/num(b)skull. Seems to combine that word and lummocks/lummox. Racks of books – better than any wallpaper. A timely reflection of the life of Mike Henbrey a man who has had to think on his feet on a day to day existence and made a good job of his life who was one of the good guy’s. A touching piece that recalls your interesting and melancholic Christmas blog–2015 has been a year of loss (Rodney, Mike, etc). People you have made quite real for your readers. May 2016 bring you much joy! 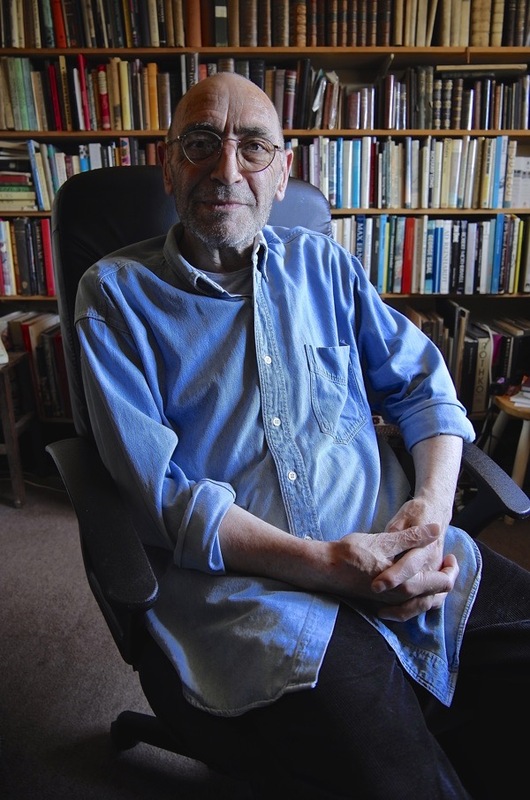 Happy to read this post, and to see again the photo of Mike Henbrey — his books, ephemera and tools about him — looking out the window with what I sense to be satisfaction at a life well lived. Thank you. Your words conjure, conjure, as the standing pages surround. Who would NOT want the vast walls of such magnificence? What a touching portrait of a civilised man. God Bless Mike – Like his books he was special. 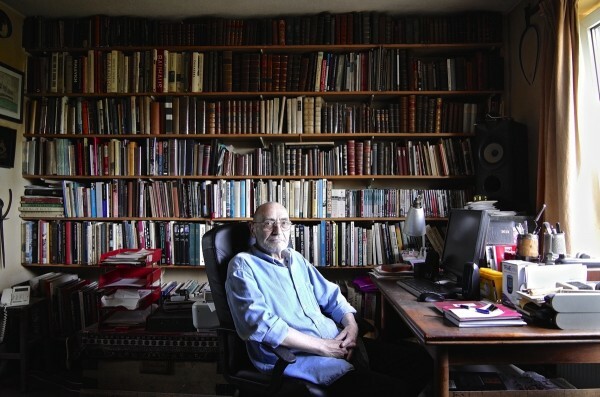 R.I.P., Mr Mike Henbrey — I hope there will be enough books for you in Heaven!